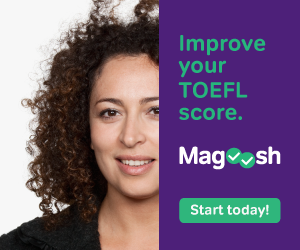 You’re looking for the best TOEFL books out there. There are plenty of TOEFL books out there but they’re not all useful or up to date. We’ve picked our favorites and wrote a brief summary about what makes each great. With the right preparation you can approach the exam with confidence. But because you’ll be spending a good amount of time studying it’s critical you get the right advice. As a quick overview, below is our list of the best TOEFL prep books. For more information, scroll below. 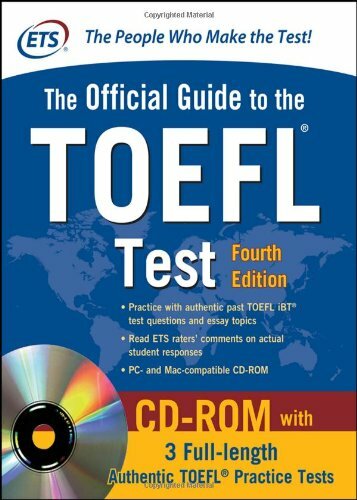 The makers of the TOEFL test are the publishers of The Official Guide to the TOEFL Test. It’s what makes this guide one of the best on the market today. The guide contains real, authentic practice questions. And getting to work with questions that are just like the ones on test day is invaluable. No other prep book can match that. In total there are 600 questions. There are also three full length practice tests to work through. They’re previously administered tests with answers and explanations. Beyond practice, there’s plenty of information covering various speaking and writing tasks. Including how to integrate your speaking, listening, and writing skills. This official guide is a terrific choice for the majority of TOEFL test takers. If you finish the tests in the Official Guide, this is the next best source of practice questions. This guides contains 5 full length practice tests. They’re previous issued TOEFL tests. In total, 300 practice questions straight from the test makers. This latest version is solid upgrade from the previous version too. The new accompanying DVD provides an interactive computer delivered version of all five tests. It helps mimic a real TOEFL iBT test setting. We can’t stress enough how important it is to work with official test questions. Barron’s TOEFL book bundle is the most popular third party TOEFL prep out today. Author, Pamela Sharpe, writes in a way that makes studying actually interesting. She’s a test prep expert that’s taught ESL courses at several universities. Including the University of Florida, Ohio State and the University of Texas at Austin. The bundle contains four books. There’s one book dedicated to TOEFL practice tests. The other three focus on TOEFL components. A book for writing, one for testing strategies, and a guide for vocabulary. Each of the books is well written and easy to understand. There are seven practice tests included. The practice questions are good quality. A rung below the official ones. The answer explanations are top notch though. There’s also a neat section that reviews paraphrasing, synthesizing, summarizing, and taking efficient notes. Barron’s TOEFL bundle is the most comprehensive TOEFL prep available today. It covers more than the official guide too. Cambridge Preparation for the TEOFL Test is a terrific prep book that’s often overlooked. There are seven full length tests included. These are the highest quality practice questions behind the official TOEFL material we’ve seen. The online tests simulate the TOEFL iBT’s actual computerized format well too. In the book itself, there are hundreds of pages of skill building materials. 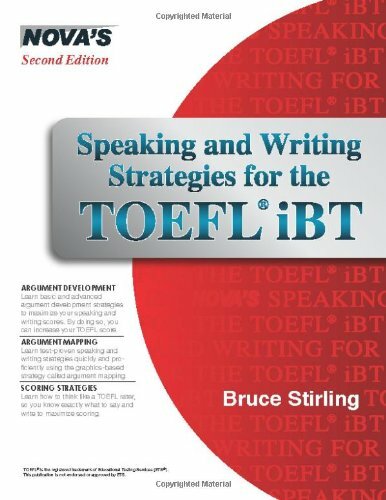 No other book focuses on TOEFL specific skills like this. There are exercises on building main ideas, developing points, writing transitions, etc. Over 200 skill building exercises in total. The skill overviews are broken down to very fine levels. This is an excellent book with plenty of practice opportunity and skill development drilling. Some of the material is dense, so it’s ideal for the intermediate to advanced test taker. Princeton Review has done a terrific job at helping you “crack” the TOEFL. Cracking the TOEFL features grammar reviews, practice drills, and strategy advice. There’s a focus towards teaching techniques to make questions more manageable. So expect to find a lot of strategy information besides the review of core testing topics. This includes going over how to guess logically and how to avoid testing traps. Princeton Review does an excellent job at reinforcing tactics to help you work smarter. Included is a full length TOEFL iBT practice test with audio exercises. There are also 39 practice drill sections targeting specific test sections. We would have liked to see more practice tests/questions. But nonetheless this is a solid study guide written by experts in field. Kaplan’s TOEFL iBT Premier prep book is a well rounded TOEFL guide that touches on a bit of everything. It’s a popular budget friendly choice. There are 4 full length practice tests included. Kaplan wrote these practice questions. So they aren’t authentic, like those found in the Official TOEFL Guides. But the 450 questions and 95 minutes of listening practice give plenty to practice with. The Kaplan prep system is unique. It includes not only the book but an online components. There are 12 online video lessons to watch. They feature test experts who review various testing strategies and insights. All accessible on any mobile device with an internet connection. Kaplan’s TEOFL guide may not be as comprehensive as other offering. But it’s an affordable prep book. And it does an excellent job at being accessible through the online portal. Practice makes perfect, and that’s what Barron’s TOEFL practice book is all about. There are more than 1,000 realistic practice questions to work on here. They’re partnered with great answer explanations too. Baron always does a nice job in this regard. Included are two full length practice tests. One for the ITP and another for the iBT variant. The included CD offers extra practice for the listening, speaking, and writing section too. There’s not much more to add here. We believe that practice with guidance is all you need to do perform well on the TOEFL. There are plenty of practice questions to work on here. And if you’re just looking for practice questions, this is an excellent source for them. Nova’s study guide focuses on the speaking and writing sections of the TOEFL. It’s different from other guides as a result. The book’s written around a strategy called “argument mapping”. The logic here is that the speaking and writing sections of the TOEFL are all argument based tasks. If you want score well on them, you need to know how to develop and deliver spoken and written arguments. It’s a unique way of studying for the TOEFL. It’s effective but it’s suited for those demanding a high score. The guide also contains instructions on crafting high scoring answers for the test. It discusses rhetorical skills and opinion development. If you’re looking to give your speaking and writing skills a boost, Nova delivers. McGraw Hill’s vocabulary guide is another terrific option for students looking to improve on their vocabulary. This is not a a substitute for encompassing TOEFL study guide. But this guide will help you learn 410 common TOEFL target words. They’re organized into eight categories and various subcategories. Lessons start off with 10 target words. Each category is comprised of definitions, word usage samples, and prep exercises. In total there are more than 150 activities and exercises. It’s all designed to ensure you learn and master the words. The current edition also comes with a flashcard-style vocabulary app filled with mini quizzes. It again, helps ensure vocabulary mastery. Barron’s Essential Words for the TOEFL is our favorite vocabulary study guide for new English speakers. It’s built for ESL students from the ground up. It’s packed with 500 ‘must know’ words. And it’s written with clear definitions, excellent sample usage sentences, and practice drills. Practice test are located at the end of each lesson and they’re not easy. However, the tests will ensure you have mastered the vocabulary. It’s an excellent aid for anyone with a weak English vocabulary. The words in this guide are easier than those found in McGraw Hill’s 400 Must Have Words for the TOEFL. But Baron’s words were chosen to strengthen your foundational understanding of English.